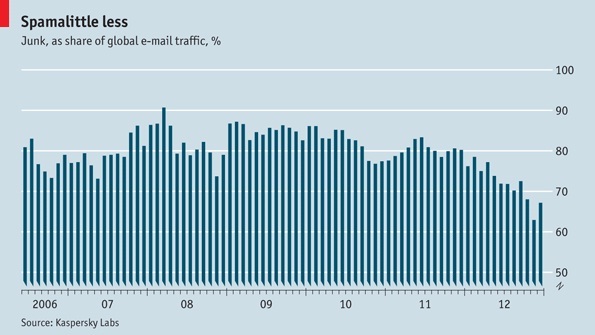 CONVERSABLE ECONOMIST: Email Spam Declines? Or Just Migrates? In the last few years, from 80-90% of all e-mail traffic has been spam. This imposes a considerable cost in terms of computer security and people's time. 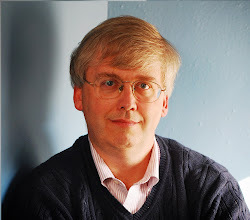 In the Summer 2012 issue of my own Journal of Economic Perspectives, Justin M. Rao and David H. Reiley discuss the "The Economics of Spam" and conservatively estimate social costs to businesses and consumers of about $20 billion per year. But in 2012, it looks as if the tide may be turning against e-mail spam, at least a bit. Some evidence comes from monitoring of spam done by Kaspersky Lab, a seller of information technology security services. In particular, Darya Kudkova has written the "Kaspersky Security Bulletin: Spam Evolution 2012." The first bar chart, from the Economist magazine, relies on Kaspersky Lab data to show monthly patterns of spam from 2006 up through 2012. 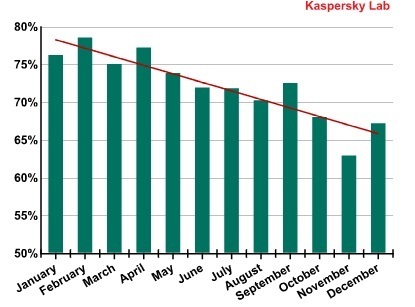 The second bar chart, from Kudkova's report, shows monthly spam patterns just during 2012. The Rao and Reiley paper in JEP offers an extended discussion of how the spam wars have evolved over time. (Here is my post on this paper from last August.) As example, they describe a study in which a group attempted to send 345 million spam e-mails, but three-quarters were blocked when the server was blacklisted. The 82 million e-mails that escaped the blacklist then had to run the normal gauntlet of anti-spam software, and ultimately, there were ultimately just 28 purchases. The main reason behind the decrease in spam volume is the overall heightened level of anti-spam protection. To begin with, spam filters are now in place on just about every email system, even free ones, and the spam detection level typically bottoms out at 98%. Next, many email providers have introduced mandatory DKIM signature policies (digital signatures that verify the domain from which emails are sent)." "When anti-spam experts answer questions about what needs to be done in order to reduce the amount of spam, in addition to anti-spam legislation, quality filters and user education, one factor that is always mentioned is inexpensive advertising on legal platforms. With the emergence of Web 2.0, advertising opportunities on the Internet have skyrocketed: banners, context-based advertising, and ads on social networks and blogs. Ads in legal advertising venues are not as irritating for users on the receiving end, they aren’t blocked by spam filters, and emails are sent to target audiences who have acknowledged a potential interest in the goods or services being promoted. Furthermore, when advertisers are after at least one user click, legal advertising can be considerably less costly than advertising through spam. "Based on the results from several third-party studies, we have calculated that at an average price of $150 per 1 million spam emails sent, the final CPC (cost per click, the cost of one user using the link in the message) is a minimum of $.4.45. Yet the same indicator for Facebook is just $0.10. That means that, according to our estimates, legal advertising is more effective than spam. Our conclusion has been indirectly confirmed by the fact that the classic spam categories (such as fake luxury goods, for example) are now switching over to social networks. We have even found some IP addresses for online stores advertising on Facebook that were previously using spam." "Advertisers have also been drawn to yet another means of legal Internet promotion: coupon services, or group discount websites where users can purchase so-called coupons. These services appeared several years ago. After a user buys a coupon, he/she presents it when purchasing a product or service and receives a discount. In 2012, coupon services gained a lot of popularity. Many companies around the world are striving to grow their client base, and in turn, clients receive generous offers. ... The popularity of coupon services has made the migration of advertisers from spam to other platforms more noticeable. At the same time, the prevalence of coupon services has had an impact on spam. Malicious users have started to copy emails from major coupon services, using the originals to advertise their own goods or services, or to lure users to a malicious website." In other words, the economics of sending and screening emails, together with the economics of online advertising, is tipping the balance a bit for spammers. Getting people to click on offers in random emails is becoming more costly; getting people to click on random advertisements is becoming easier. Before you send a credit card number, be sure you know who is at the other end.